Third printing, paperback edition with French flaps. This edition also features a new color, glossy art section and extra material. Qabalah, Qliphoth and Goetic Magic is a unique practical introduction to magic. 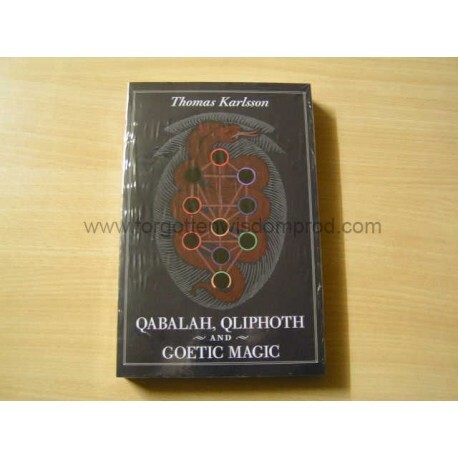 The main thread of the book is the exploration of the Qliphoth and the dark mysteries which have for so long been a repressed part of western esotericism. Instead of ignoring and denying the dark side, the author reveals, step by step, how man can get to know his Shadow and, through this, reach a deeper knowledge of the Self. By exploring and not by repressing the Shadow it can be transformed from a destructive force into a creative power. The book deals with the problem of evil, the symbolism behind the fall of Lucifer and man’s creation process according to Qabalistic philosophy. The theories that are presented in this book are also linked to practice. Several examples of rituals, meditations, magical exercises and occult correspondences can be found within. Qabalah, Qliphoth and Goetic Magic contains more than one hundred demonic sigils and pieces of art that were created specifically for this book. A unique collection of all the sigils from the classic grimoires Lemegeton: The Lesser Key of Solomon and the infamous Grimorium Verum are also included. Thomas Karlsson has studied and practiced the occult sciences for more than fifteen years and is the founder of the esoteric order Dragon Rouge. He is Ph. D. in History of Religion and holds a M. A. in History of Ideas. Thomas Karlsson authored the book Uthark—Nightside of the Runes (Ouroboros Produktion, 2002) and gives seminars and lectures on a regular basis.